A few weeks ago we were in Las Vegas for a conference where Rod was speaking on business valuation (that’s what he does when he’s not proof-reading my blog posts). His response threw me for a loop. He said that, while the dogs are cute, people want to be able to imagine themselves in the places we travel, and if Rod or I were in the photos, it would make it easier for the folks reading the blog to see themselves there. And then, not two days later, I was talking to a friend who’d posted a picture of herself with her dogs on Facebook and was surprised at the level of interaction the photo got compared to ones of just her dogs. That really got the wheels turning … perhaps we pet bloggers are spending too much time hiding in the shadows. Maybe it’s time to come out from behind the curtain and introduce ourselves. We bounced the concept around a bit more, and it turns out, a bunch of bloggers thought it was a good idea! And that’s how the “Meet the Bloggers” blog hop materialized. We pour our hearts and souls into our blogs, but rarely come out from behind the camera or keyboard to make an appearance in our own stories. Now’s the time to introduce yourself and let us get to know you a bit! 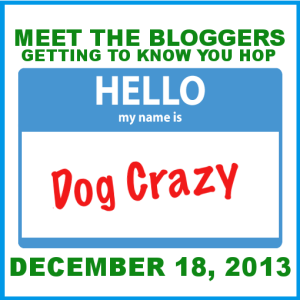 On December 18th, I’ll be co-hosting this fun blog hop with a bunch of other fantastic bloggers: AJ from I Still Want More Puppies, Jodi from Kol’s Notes, Mel from No Dog About It, Julie from The Daily Dog Blog, Jennifer from My Brown Newfies, Kim from CindyLu’s Muse, Lauren from Life With Desmond, Leslie from Bringing Up Bella, Jodi from Heart Like A Dog, Kristine from Rescued Insanity, Peggy from Peggy’s Pet Place, and Dawn from NEPA Pets. 2. Include a recent picture of yourself in the post. Take a selfie – pose with your pets or without … whatever your pleasure, as long as it was taken within the last few months. 3. Add a link to your post to the Linky list below, which will open on the 18th at 12:01am PST, and then hop around and meet your fellow bloggers. THAT’S IT! If you’re in, grab the badge that best fits you, let your friends know, and we’ll meet up again on the 18th to know each other a little better. On January 10th we’ll once again be hosting the annual Pet Blogger Challenge! More on that in the next couple weeks, but put it on your calendars now and get ready to celebrate 2013’s successes and set your expectations for 2014.